Learn to appreciate all the kindness Hashem bestows upon us. 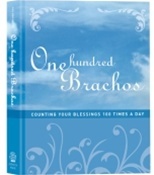 The one hundred brachos we make each day can infuse our waking hours with the realization that Hashem is always with us--helping us, holding us, carrying us on His shoulders. They remind us how much we have to be thankful for, how much we owe Hashem for the boundless chasodim with which He constantly showers us. Now Rabbi Moshe Goldberger has given us a wonderful commentary on the one hundred daily brachos, explaining and clarifying the meaning and intent of each bracha. His insights make the brachos fresh and relevant, powerfully demonstrating how they connect to our everyday lives. This book is invaluable for students or anyone seeking inspiration or motivation for self-improvement. It makes a great gift, for yourself or someone else!